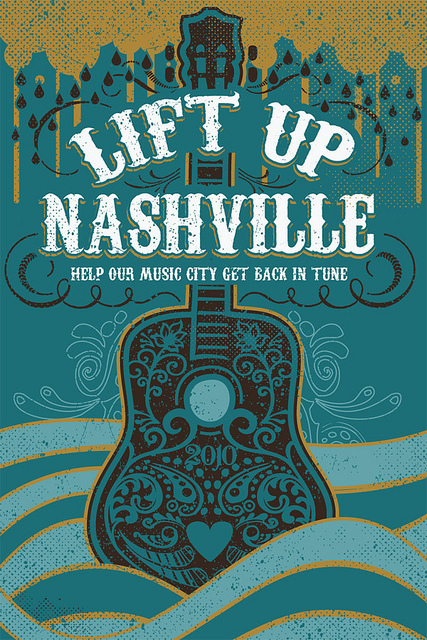 Lift Nashville. They need your help. Throughout this decade, the tragedies seem to keep hitting some of America’s special cities. The latest, of course, is Nashville. Some FOF’s are trying to help, but until they solidify their plans (hard to do when their city is literally drowning) here’s something you can do now. Like we suggested at the start of Hurricane Katrina, if you don’t have a regular charity you know about, try and buy a relief poster or two. 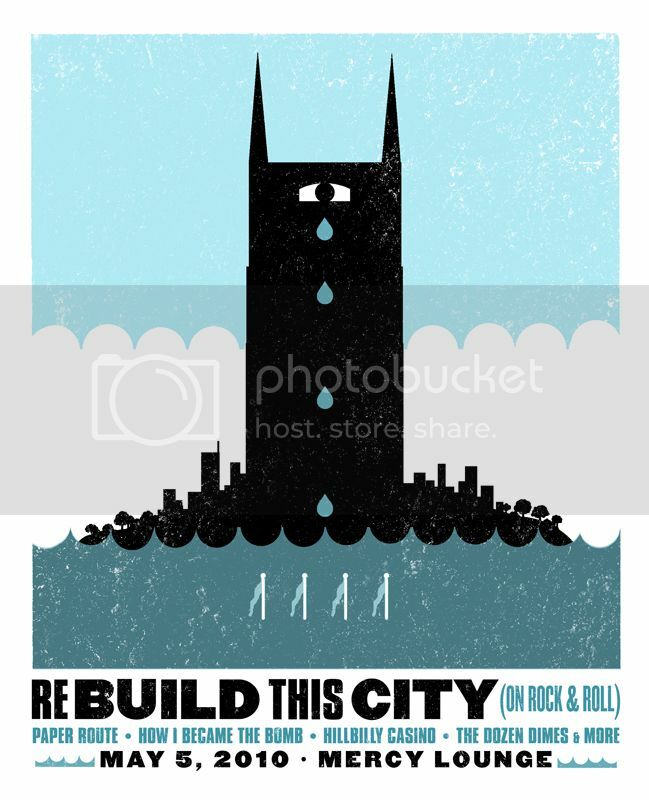 The ones posted came to my attention at one of my favorite art poster sites, OMG Posters!, but there are plenty of others (just Google “Nashville relief posters”). The profits go to various city based organizations and you can be sure of the designers’ passions for helping. Do what you can, this great American town needs your help. There’s no book release party this week, but nonetheless our poster book is available for sale over at Amazon.com. I’ve had a lot of fun with our self promotion over the years, especially posters. It turns out I came of age during posters last great hurrah in the 60s, when every kid had day-glo posters pasted all over the bedroom walls, horrifying parents everywhere. But slowly over the years posters went from a commercial necessity to a collectible art item. I wanted in on the action, and sporadically commissioned posters in the 80s, often as promotion for my advertising agency, but it wasn’t until the cartoon biz my jones fired up in earnest. Starting with What A Cartoon!, where I wanted to give our shorts creators their due, and continuing with Frederator’s launch, I’ve looked for a good excuse to litter some limited edition walls myself. Sporadically, we try to get an annual New Year’s release, and then something practical (usually budget) gets in the way. Certainly, we try and get something going for most of our new cartoons too. 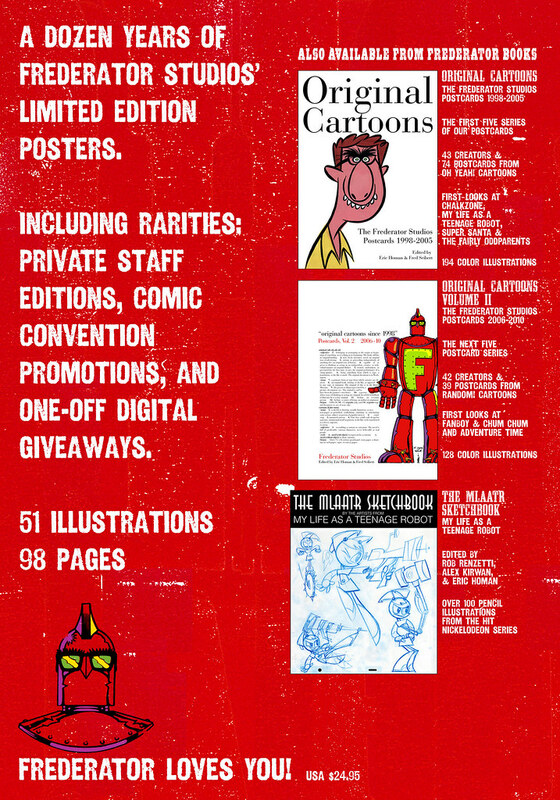 So, keeping in the tradition the book collection of our first series of postcards, we collected 12 years of Frederator posters together for your viewing pleasure. As a bonus, there most of the HB What A Cartoon! posters too, plus a lot of one-off digitals for events you might or might not be aware of. And some Comic-Con collectibles too! “51 illustrations” in all, as it hypes on the back cover. You might have seen the earlier digital download draft, but here’s the final, published version, if you want to take a quick, electronic gander. PS: Don’t forget to check out the cool Fanboy & Chum Chum and Adventure Time stuff that’s included. As anyone who’s known me for more than a few minutes is well aware, I like posters. Too much. The 60’s was pretty much the end of the useful commercial poster (though in some cities, transit posters will occasionally still work) but in the last 40 years the limited edition art poster has been alive and well. My ad agency made more posters than they were sometimes comfortable with, and when I got into cartoon biz my habit continued unabated. At Frederator our bank account slows us up quite a bit, but I can be persuasive in convincing our partners that it’s a really good idea for them. Now that there are a lot of easy ways to publish books on demand on the internet, I’m starting to go a little book crazy. The latest one up, edited by Eric and me, is a collection of our posters. You can see the latest draft up above, and it should be available on Amazon next month. Next, title cards and the latest postcards. By the way, here’s the description I’m going to putting on Amazon. If any of you have a better way to do it, please let me know. I’m eager to hear what you think. 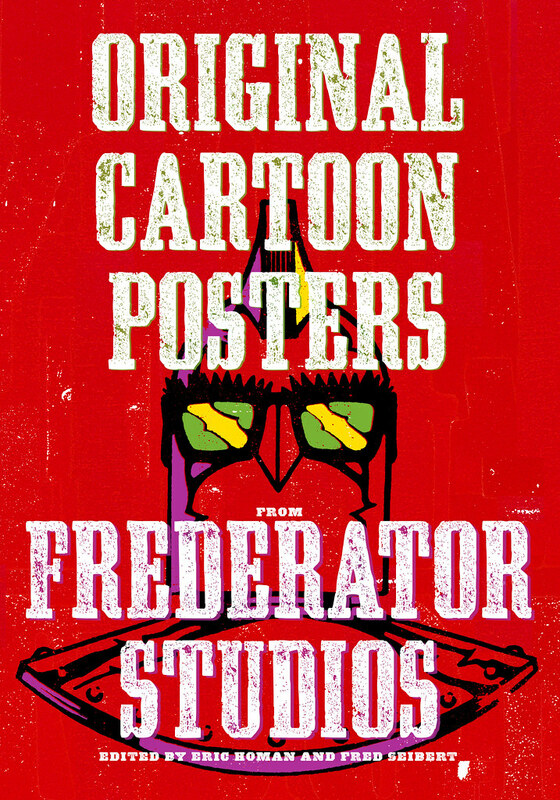 Original Cartoon Posters collects a dozen years of the Frederator Studios limited edition poster releases. Since 1998, Frederator has been America’s leading independent cartoon producer, with smash hits like ‘The Fairly OddParents’, ‘Fanboy & Chum Chum’, and ‘Adventure Time’, and the big idea cartoon incubators What A Cartoon!, Oh Yeah! Cartoons, and Random! Cartoons. Showcased here for the first time, you’ll find rarities like private staff editions, comic convention promotions, and one-off digital giveaways.